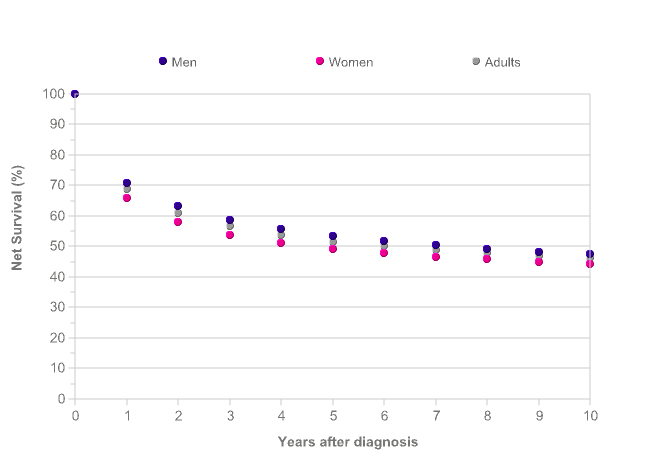 71% of men survive leukaemia (all subtypes combined) for at least one year, and this is predicted to fall to 54% surviving for five years or more, as shown by age-standardised net survival for patients diagnosed with leukaemia during 2010-2011 in England and Wales. Survival for women is slightly lower, with 66% surviving for one year or more, and 49% predicted to survive for at least five years. Leukaemia survival gradually continues to fall beyond five years after diagnosis. 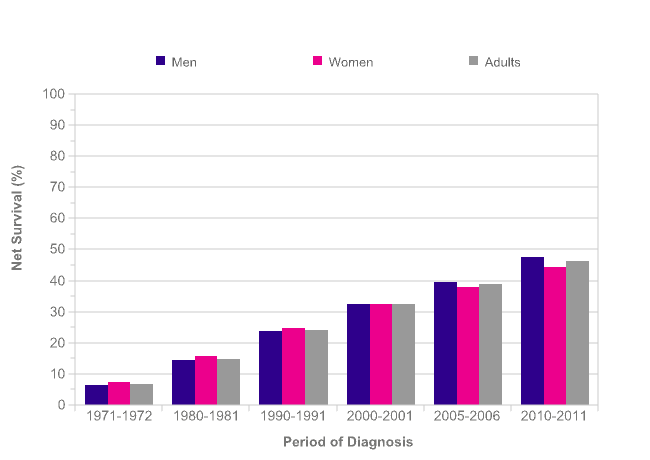 48% of men and 44% of women are predicted to survive their disease for ten years or more, as shown by age-standardised net survival for patients diagnosed with leukaemia during 2010-2011 in England and Wales. Out of 20 common cancers in England and Wales, ten-year survival for leukaemia ranks 8th lowest overall. Survival for leukaemia is reported in Scotland and Northern Ireland,[2,3] though it is difficult to make survival comparisons between countries due to different methodologies and criteria for including patients in analyses. 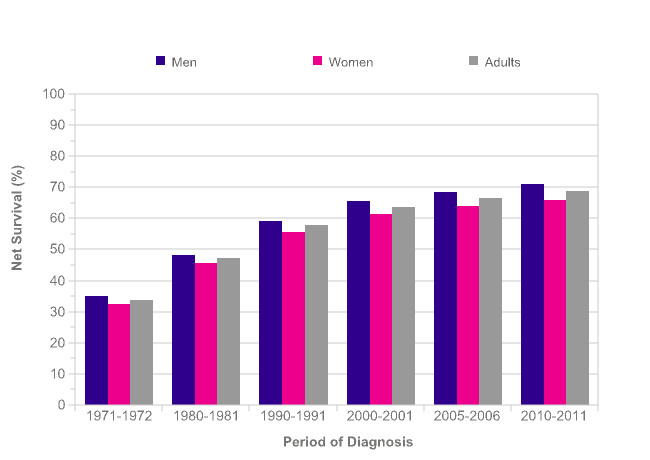 Five-year survival for leukaemia (all subtypes combined) is generally higher in younger men and women, decreasing with increasing age. 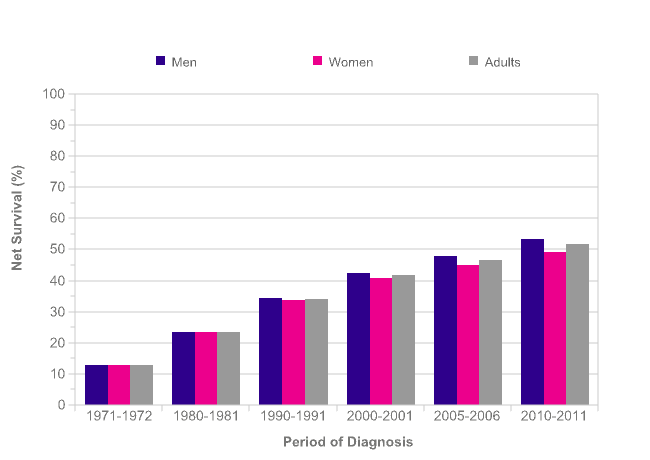 Five-year net survival in men ranges from 74% in 40-49 year-olds to 29% in 80-99 year-olds for patients diagnosed with leukaemia in England during 2009-2013. 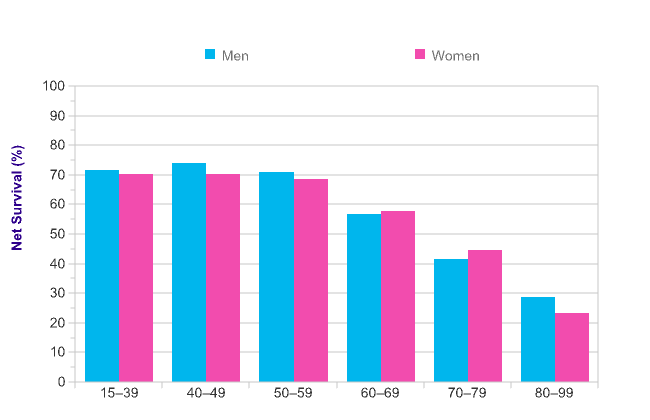 In women, five-year survival ranges from 70% in those aged under 50 to 23% in 80-99 year olds. As with most cancers, survival for leukaemia is improving. Some of the increase is likely to be attributable to changes in the diagnosis, classification and registration of leukaemia, so interpretation of these trends should be undertaken with caution. One-year age-standardised net survival for leukaemia (all subtypes combined) in men has increased from 35% during 1971-1972 to 71% during 2010-2011 in England and Wales – an absolute survival difference of 36 percentage points. In women, one-year survival has increased from 33% to 66% over the same time period (a difference of 34 percentage points). Five-year age-standardised net survival for leukaemia in men has increased from 13% during 1971-1972 to a predicted survival of 54% during 2010-2011 in England and Wales – an absolute survival difference of 41 percentage points. In women, five-year survival has increased from 13% to 49% over the same time period (a difference of 36 percentage points). Ten-year survival has followed the same trend as one- and five-year survival since the early 1970s. Ten-year age-standardised net survival for leukaemia in men has increased from 7% during 1971-1972 to a predicted survival of 48% during 2010-2011 in England and Wales – an absolute survival difference of 41 percentage points. In women, ten-year survival has increased from 7% to 44% over the same time period (a difference of 37 percentage points). Overall, more than 4 in 10 people diagnosed with leukaemia today are predicted to survive their disease for at least ten years.